... on a road bike diaghram I create are almost always of equal length/measurement. 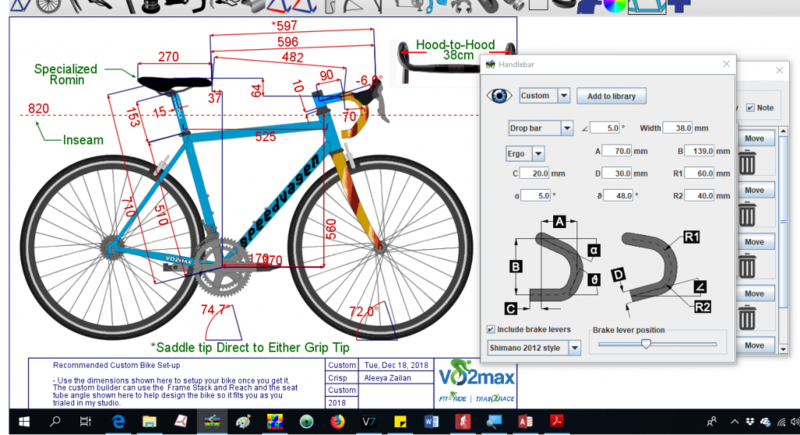 I assume "Direct" is meant to represent a diagonal measure from the saddle tip across to either one of the brake hoods while "Projected" is a midway point between both brake hoods. IF my assumption is correct, then these two measures should always be different with the Direct being the longer one. However I have found on most occassions they are identical but sometimes (and I have not figured out why) they are different and closer in measurement to what I assume they represent. Is this an error in the software or do they represent something else? You're correct in your interpretation of how direct measurements compare to projected measurements. There's an illustration at: bikecad.ca/saddle_tip_to_brake_hood. If the dimensions appear to be the same when you'd expect them to be different, there are two possible explanations. First, if you set the handlebar width to 0mm, then there will be no difference between these numbers. A second possibility is that you are not showing enough decimal places in your dimensions for the difference to be apparent. You can change the number of decimal places for linear and angular dimensions in the top of the Dimensions dialog box. If this doesn't explain the discrepancy you are seeing, I'd be interested in seeing the BCAD file for the model in question. Please send it to me when you get a chance. Handlebar width was set to 38mm. Dimensions are to the mm. There is only a one mm diffference between the direct and projected measures. When I take them off the bike itself, the diffrence is ~30mm. SO something is not right. I cannot attach the BCAD file here as the application won't allow me so i m sending a snapshot of the screen. You must have meant to enter 38cm for handlebar width which would be 380mm. 38mm is tiny for a handlebar width. 38mm is close enough to zero to have no significant effect on your direct distance measurement.